Planning is well underway for the rebuild of the Burns Lake sawmill, destroyed in an explosion/fire a year ago; the mill will be significantly different, featuring the latest in sawmill design and machine technologies, and have the ability to process small diameter and bug-killed wood. The Babine Forest Products sawmill in central British Columbia is to be rebuilt. But it will be significantly different than the mill destroyed in a horrific explosion and fire on a frigid night in January 2012. The new mill is due for completion in 2014 and will be smaller, with annual production of around 200 million board feet, down from the original 340 million board feet. Log consumption will be reduced by about 35 per cent. The wood basket required to sustain the mill will be more diversely sourced. The new mill is expected to benefit from the latest in sawmill design and machine technologies, with the ability to efficiently process small diameter and bug-killed wood. Dust accumulations are suspected of being a factor in the Babine tragedy that killed two sawmill workers and injured 20. An eerily similar incident last April at Lakeland Mills in Prince George also claimed two lives and injured 22 others. Both incidents were subject to intense scrutiny and analysis by regulatory agencies. WorkSafeBC has announced it will hand over its voluminous material to Crown counsel for review (see accompanying box on page 4 for a summary of the BC Safety Authority’s interim recommendations on the sawmill incidents). The Babine and Lakeland explosions galvanized the forest industry to voluntary in-house investigation of its procedures and sawdust mitigation strategies. Many mills have initiated improved standards and practices as a result. Hampton officially announced its decision to rebuild its Babine sawmill this past December after much soul searching and analysis. It will be located at the same site, east of Burns Lake. The planer mill at the location was unscathed by the explosion and fire. Apart from owning the sawmill site land, First Nations have an 11 per cent stake in Babine Forest Products and Decker Lake Forest Products, a successful one daily shift specialty lumber product mill located west of Burns Lake. First Nations also contributed about 45 per cent of the Babine mill’s workforce. “We have to consult with First Nations to manage the land properly. They have timber of their own and that partnership helps,” explained Zika. The Burns Lake Community Forest’s cutting privileges are also expected to be part of the new Babine mill’s timber supply. A B.C. government legislative committee investigation last summer examined the mid-term regional timber availability to help provide Hampton with an updated perspective of what it might expect. Superimposed on that are the impacts of the mountain pine beetle epidemic. The Burns Lake TSA was hard hit by the infestation. It’s tough to get a handle on the shelf life of standing dead lodgepole pine because it can vary from stand to stand, noted Zika. But the beetle wood does affect production, recovery, grades and influences revenues accordingly, he added. “As a company, we have to decide what’s going to be left. And it’s a question of what products we can produce. The Asian market is critically important for mountain pine beetle lumber,” he commented. Zika said while Hampton will have to become more creative with its log search, he’s very optimistic about the future strength of lumber markets in the next five to 10 years in both the U.S. and Asian arenas. An increasing SPF product demand will also assist Hampton’s lumber and plywood wholesale marketing business around the world. Other factors helped Hampton reach its decision to rebuild or not and where to rebuild conundrum. Zika said Babine is fortunate to have a good pool of experienced people, many of whom are still available for the new Babine near Burns Lake. Zika said throughout the last year’s ordeal “we had great support from the Steelworkers (Union)”. The strength of the Canadian dollar against its U.S. counterpart was an additional consideration. 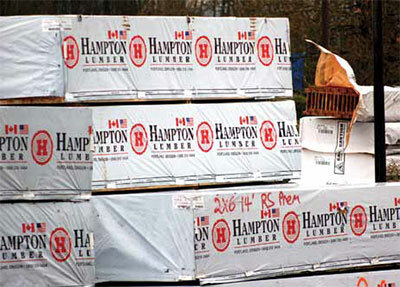 Hampton Affiliates made its first foray into B.C. with its acquisition about six years ago of the Babine and Decker Lake mills. They wanted to know if they were good enough to be global—that was their challenge to discover, recalled Zika. The decision to stay in B.C. 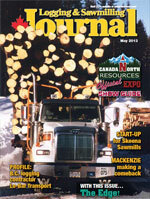 and rebuild the Babine Forest Products sawmill helps supply the answer. A recommendation report from the BC Safety Authority into the Babine and Lakeland explosions and fires contains specific safety management improvements for mill owners and operators, the Office of the B.C. Fire Commissioner and the Canadian Standards Association to consider. The recommendations for mill owners and operators are: have a qualified professional prepare a mill site hazard assessment to include locations of sawdust build-up spots; implement a plan to help keep machinery dust free or shielded; implement a dust management plan linked to the mill’s identified hazard locations and fire safety plan. The BC Safety Authority recommendations for the fire commissioner’s office: prepare a qualifications list for personnel consulting with mills on wood dust combustion hazards; publish prevention guidance material; implement the material into fire safety plans and BC fire code. For CSA to consider: implement wood dust rules into the Canadian Electrical Code; add wood dust to the hazard classification system; align natural gas and propane operation standards to the wood dust hazard.